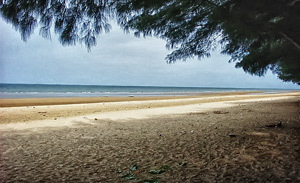 About 30 km in northwest side of Sumenep, there is a beautiful Lombang beach. It is located in Lombang village, Batang – Batang district. There are many spruce fir farmers that sell their spruce fir bonsai trees. Obviously, Lombang beach bordered by thousands of natural spruce fir (casuarinas) that make the beach feels fresh. This Casuarinas Equisetifolia (Cemara Udang) is naturally growth along Lombang beach and it is very famous in the world, because Casuarinas Equisetifolia can live only in Indonesia and China, so that it feels calm and comfortable. Lombang beach is interesting tourism object to be promoted to all Indonesia area, even to the world. The position of Lombang beach in south sea of Java Island can facilitated the visitors to see the beautiful sunrise. The other facility around Lombang beach is foods and beverage merchants, such as; Rujak and young coconut ice. The beach is very clean and has clear water with interesting small heap of white sand. This Lombang beach tourism object will crowd and splendor in people party or public festival that held a week before Feast holiday.